To honor the University’s Senior-Class-Poet contestants and to commemorate National Poetry Month, the Library is publishing contestants’ poems on Falvey’s blog. The Library also has created posters for the contestants’ poems, which are displayed throughout the first floor. Each spring semester, all seniors are encouraged to enter the Senior-Class-Poet Contest. The Department of English will announce the 2013 Senior-Class Poet later this semester. of our assembly line house. and playing possum under ‘Haven Green’ paisley sheets. on the hardwood kitchen floor. …………of raw throats and roasted eyes. …………we left the scene, our moonlit eyes and two hands, hand in hand. 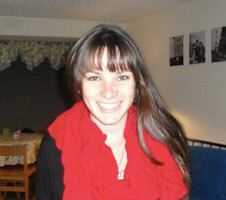 Christi Danner is an English major from Allentown, Pa.